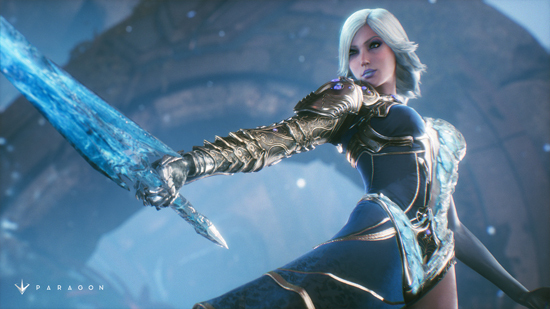 Aurora, the next Hero to join the free-to-play PC and PlayStation 4 MOBA, Paragon. Aurora will be free to play when she joins the fight on January 31. Aurora is an elusive, crowd-control specialist who uses her abilities to manipulate the cold. A powerful initiator, Aurora uses the cold to freeze her enemies and take control of the battle. A detailed list of Aurora’s abilities can be found below. Frozen Simulacrum (RMB/R1) - Allows Aurora to leap in a target direction, leaving behind a solid ice clone of herself. Glacial Charge (Q/Square) - An icy trail launches Aurora forward, dealing damage, pushing enemies aside and blocking projectiles from the front. Hoarfrost (E/Circle) - Creates a ring of hoarfrost around Aurora, dealing damage and rooting enemies caught in the ice. Cryoseism (R/Triangle) - Aurora creates an ice earthquake. Enemies in the area will turn to ice, which then explodes, causing damage to the Hero and spreading the effect to other nearby Heroes and minions. In addition, Epic has released a new free bundle for PlayStation Plus members. Players can pick up the Paragon Booster Pack in the store, which includes several in-game bonuses, including a Moon Viper skin for Khaimera, 200 coins, 1 loot crate/key and more!